Jill Pfister, assistant dean of academic affairs for CFAES, retired from Ohio State effective Sept. 30 after 33 years at the university and a total of 36 years of public service. Pfister is known for her passion in working with students as they prepare for graduation and the next step in their lives. She has also been instrumental across the university in developing the degree audit system for undergraduate coursework, operationalizing several tools to assist faculty and students in advising, and leading the faculty through curriculum reform, including semester conversion. Pfister is known for her passion in working with students as they prepare for graduation and the next step in their lives. She started in the college when there was just one computer that was hard-wired to the student information system, called Legacy, with the student system called MARX. She coordinated the security and implementation for all faculty advisers to have access to MARX through their desktop computers. The Legacy system held up until 2010 when the university implemented SIS through PeopleSoft. CFAES is the only college that has an online application for graduation. Under her leadership, Alpha Zeta Partners received the University Outstanding Diversity Program in 2013 and the Ed Johnson Outstanding Student Organization in 2009, 2010, 2011 and 2013. She received the Towers Faculty Award in 2012 and the Outstanding Service to Students Award in 1995, 2009 and 2012. She received Ohio State's Distinguished Staff Award in 2006. She has served CFAES outside Columbus as well. She has served as the Classy Critters 4-H Club Adviser since 1999. The 4-H Youth Development Program is a part of OSU University Extension, the outreach arm of the college. Pfister graduated from CFAES in 1976 with a major in agricultural education and was licensed to teach high school agriscience. She began her career at the University of Maryland's Institute of Applied Agriculture as an instructor and assistant director in 1977. She returned to Ohio State in 1980 to complete her Ph.D. in agricultural education with a minor in higher education administration. 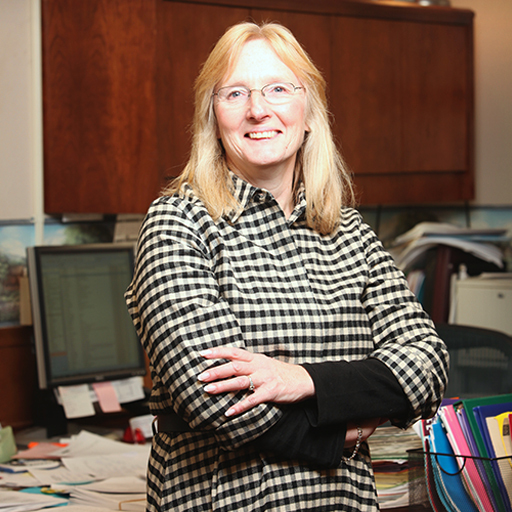 She joined CFAES in September 1982 as a college counselor, was promoted to college secretary in 1986, and was promoted to assistant dean, academic affairs, and college secretary in 1991. A celebration is planned for Spring Semester.